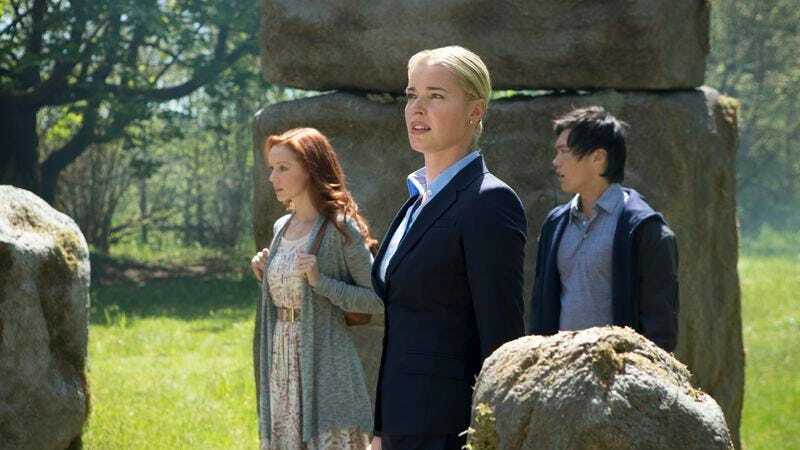 In TNT’s fantasy adventure series The Librarians, Flynn Carsen doesn’t pull punches in criticizing the woeful lack of training for the next generation of caretakers tasked with protecting the world’s magical artifacts. “We take a highly intelligent but totally unsuspecting individual, drop them in a world of magic, and then expect them not to die before they learn where the toilet is,” says Flynn (Noah Wyle), recalling his own bumpy transition from a Mensan milquetoast to The Librarian, a swashbuckling collector of charmed antiquities. The line is one of many signals in The Librarians to let viewers know they don’t necessarily have to be fans of the trilogy of TNT original movies from which the series is adapted to get into the show, they merely need to have an affinity for weaponized magic, hunts for buried treasure, and a heaping helping of tongue-in-cheek humor. But with a 10-episode season ahead of it, the challenge The Librarians faces is not about how much the audience enjoys globetrotting quests and fantasy elements, it’s about how long it takes before the show’s gumbo of blockbuster ingredients becomes overwhelming. John Rogers, who adapted the show from David Titcher’s trilogy of screenplays, seems to understand the premise needs rebalancing to become a sustainable series. The Librarians immediately gets to work on those tweaks, starting with a wise, if devitalizing, demotion for Wyle, who starred in all three movies but will only recur in the series. Filling his shoes is Eve Baird (Rebecca Romijn), a counter-terrorism agent who receives an invitation to the Metropolitan Library, where dutiful book jockey Charlene (Jane Curtin) escorts her to a subterranean sanctum housing a collection of mystical artifacts. In a tour of the Metropolitan Library, it would be literally identified as “where the magic happens.” Eve has been chosen as The Protector, essentially a bodyguard to The Librarian, the person who ensures there’s someone guarding the guardian. But before Flynn and Eve can start getting their will-they-or-won’t-they on, Flynn announces he needs to delegate some of his duties, having grown fatigued after a decade of crossing rickety rope bridges in search of fancy cups. The Library—the building does its own recruitment—sends invitations to Cassandra (Lindy Booth), Ezekiel (John Kim), and Jacob (Christian Kane), who combine their unique gifts to protect the Library from black-magic villains while competing to determine who will assume the head position. The character influx is where The Librarians becomes a series, and one series in particular: Leverage, which also came to TNT courtesy of Librarians producer-director Dean Devlin and focused on a ragtag group of fringe specialists trying to jell as a unit despite incompatible personalities. The reason for the discord is different here than in Leverage; Leverage’s redeemed crooks were usually thwarted by criminal self-interest, while the librarians-in-training are marred by the same book-smart awkwardness that plagued Flynn when he took the job. But the similarities run deep and are hard to ignore, with Devlin behind the camera and Kane, who played Eliot in Leverage, in front of it. The Leverage echoes are not a detriment, but even in its earliest episodes, The Librarians displays some of the issues that led to the earlier show’s decline. Specifically, it defines its characters through their utility: Eve is the Langley-trained den mother; Cassandra’s extreme synesthesia allows her to literally follow her nose to clues; Ezekiel is the tech savant; and Jacob has an encyclopedic command of art history. The show is always focused on the task at hand, not the people driving it, so in the same way Leverage was dependent on the novelty of the caper-of-the-week, The Librarians will be limited by the storied trinkets it introduces. The show’s bigger hurdle, at least as it concerns attracting new viewers, is the family-friendly, summer blockbuster tone responsible for its massive success as a movie franchise. The Librarians, like the movies that spawned it, is giddy, goofy fun, the type of high-energy nonsense for which the phrase “madcap romp” was invented. But the blockbuster model, with its elaborate set pieces, broad punchlines, and chaste romances, is tough to pull off week after week. And even if it is something the producers are capable of replicating across 10 installments, doing so could become an endurance test for Librarian junkies, let alone newbies. There’s also the issue of the performances. Wyle’s all-out approach to Flynn works precisely because he’s so hammy in it, and it’s hard to begrudge someone having so much fun, though it remains to be seen how limited his recurring role will be. Romijn, on the other hand, remains gorgeous yet wooden, and to the extent Kane, Booth, and Kim could make up the charisma gap, the thinness of their characters hems them in. If The Librarians can balance its elements effectively, it stands to become as charming as it is goofy. But early on, it provokes a different question than most movie-to-series adaptations, asking not if a limited premise can be expanded, but if a perfectly scalable premise should be expanded.